It's just their way of auto blending the textures. When you place a texture with it, it will automatically place textures around that go with it. Really speeds up the process. That's a sharp looking program, what is it? Xadets Map Editor v1.1. It's available somewhere on the forum. Took a bit to figure out but finally got the map to load. it's looking good. Seems like the heightmaps are a bit off though so objects won't match up with some bits. I'd say lower it by 50% and it should more or less match. Tsuki wrote: Xadets Map Editor v1.1. It's available somewhere on the forum. I'm not sure what version is available on osrose right now ( as its been years since my last visit here ). Looks like it's just a wrongly named file. Everything looks the same and still claims to be v1.1. Matches what I use now. Well I've made a little more progress on this project after getting some good pep talks from others. 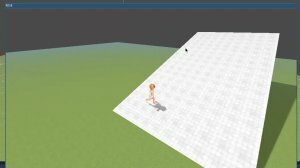 I decided to postpone work on the terrain system and start focusing on some of the core mechanics. What's the point in having levels if you can't move around them! Oh, and since I hate 3D rotations the character doesn't look where he is walking yet . I added some basic lighting to the scene to make it more interesting. FYI i stopped working on this project after a while. I found Godot to not be a suitable engine for what I was trying to achieve. The final project ended up here: https://github.com/rminderhoud/rose-godot. I might pickup a similar project in the future but I would likely use a different engine. I've wondered about going right back to basics with something like SFML. Basically a library of OpenGL wrappers and objects. Has some nice sprite handling.